Interest rates have just now, in real terms, moved above zero….so interest rates are still accommodative, but we’re gradually moving to a place where they’ll be neutral…not that they’ll be restraining the economy. We may go past neutral. But we’re a long way from neutral at this point, probably. The “long way” comment implies more tightening to come, and the fact that he broached the possibility of going “past neutral” was a surprise. I wanted to see what he meant here, so I looked at the data. 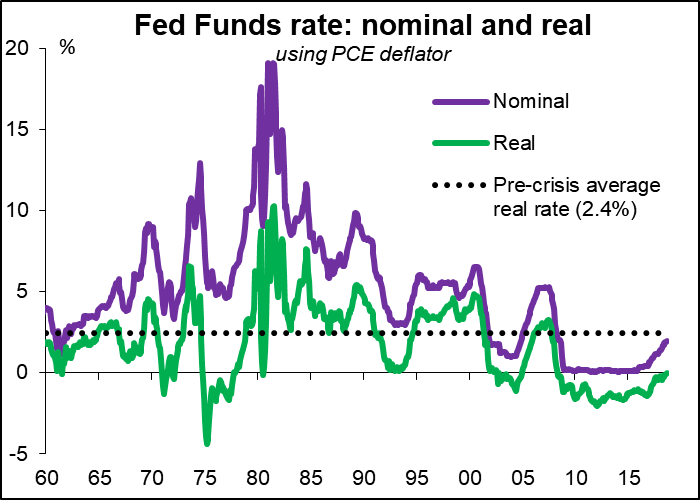 Currently, the effective Fed funds rate is 2.18% while the personal consumption expenditure (PCE) deflator, the Fed’s preferred inflation gauge, is 2.0%, meaning that the real Fed funds rate is 0.18% -- exactly as he said, it just moved above zero with the latest hike in the Fed funds rate. Historically, the average for this measurement is 2.4%, meaning that if inflation stays where it is and they bring real rates back to what was previously considered neutral, the Fed funds rate would have to rise a further 220 bps – far more tightening than is currently priced in. Sure enough, the market quickly priced in an additional 11 bps of tightening – about half a rate hike. As the graph shows, the spread between US and other bond markets has been widening steadily to the USD’s advantage. That’s the basis of the dollar’s strength. 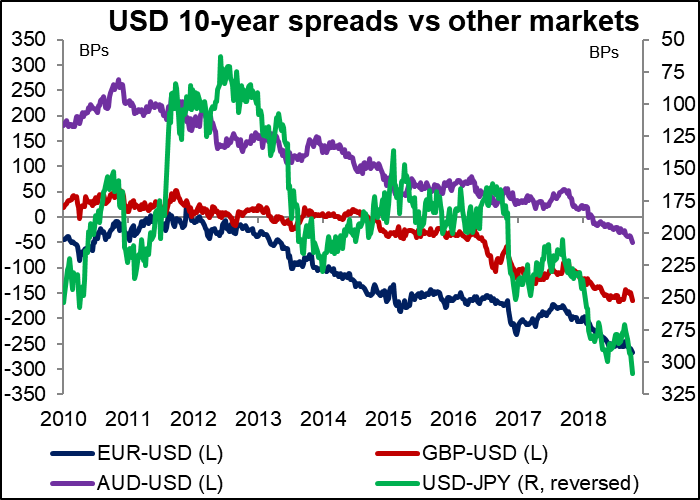 The spread vs AUD (purples line) is particularly noticeable; historically, AUD (and NZD) bonds yielded more than Treasuries, but this spread turned negative (i.e., favor of USD) at the beginning of the year and has widened further as the RBA and RBNZ appear willing to keep rates on hold indefinitely. That’s probably behind the weakness in AUD and NZD recently. I must say, I’m a bit surprised at the dollar’s strength. I had thought the Fed’s future plans were pretty well known and already discounted. 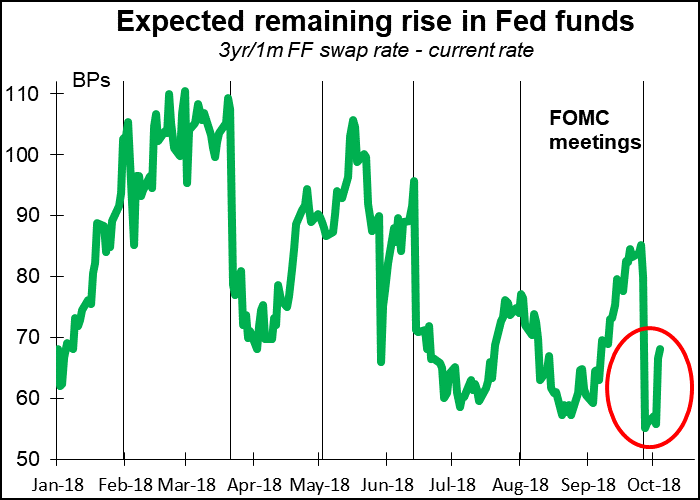 But with the US employment picture improving even more and the possibility of a restrictive Fed funds rate now on the table, it looks like the dollar may be able to rally further against the backdrop of other major central banks taking a more cautious approach to normalizing policy. 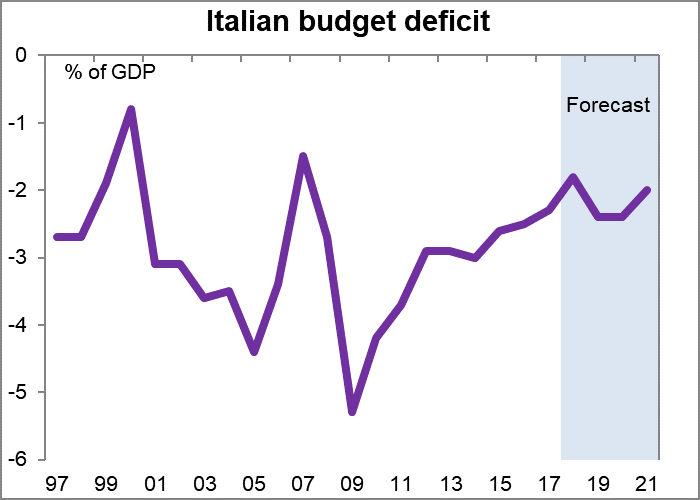 Elsewhere, the turmoil in Europe calmed down a bit as Italy caved in and agreed to keep its budget deficit in 2021 to a more respectable 2.0% of GDP, rather than the 2.4% that the new government had hoped for. 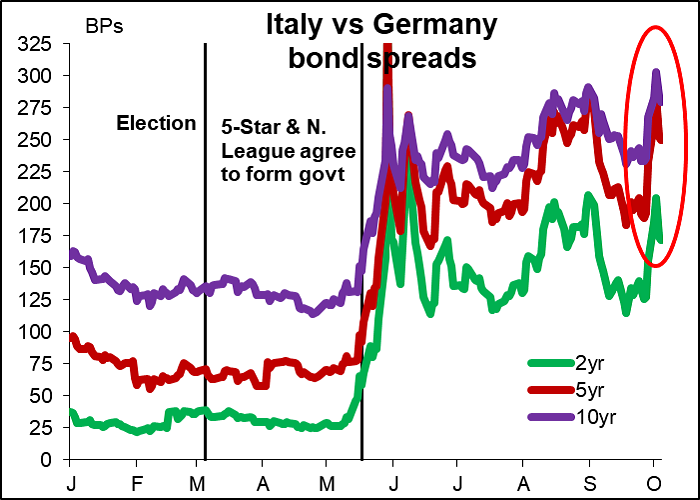 Italian bond yield spreads retreated somewhat but still remain well above their recent levels, indicating that the market doesn’t entirely believe this. The Eurozone countries’ budgets, including Italy’s, are due to be submitted to the European Commission by 15 October. By law, the EC has the right to reject a draft budget from any eurozone country within 10 days after receiving it. The question is, should the EC file it under “non-fiction” or “fiction”? The issue isn’t just the 0.4 ppt of GDP difference. The issue is whether Italy will adhere to EU rules or not. It’s political, not economic. The eurozone is predicated on the idea that all the countries stick to a common rulebook. If the third-biggest country flouts the rules, then the rules are pretty meaningless. France and Germany have both broken the budget rules when it was convenient for them, but then again, the French and German banking systems don’t necessarily need a bailout the same way the Italian banks do. We’ve got a pretty quiet week ahead of us. As usual for the second week of the month, there’s not that much on the schedule. There are no major central bank meetings. The focus of the week will be on Thursday’s US CPI. 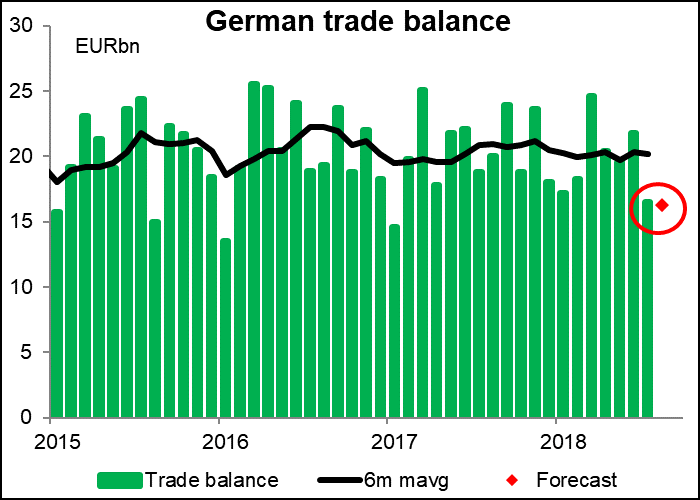 Other indicators of interest will be trade data from the UK, Germany and Japan (current account from the latter), and industrial production from Germany and the UK. The headline US CPI is expected to fall to 2.4% yoy from 2.7%. Prices have been soft recently; the plunge in apparel prices in August was the biggest monthly decline since the 1940s, while prescription drug prices were unchanged after at 1.0% mom decline in July. 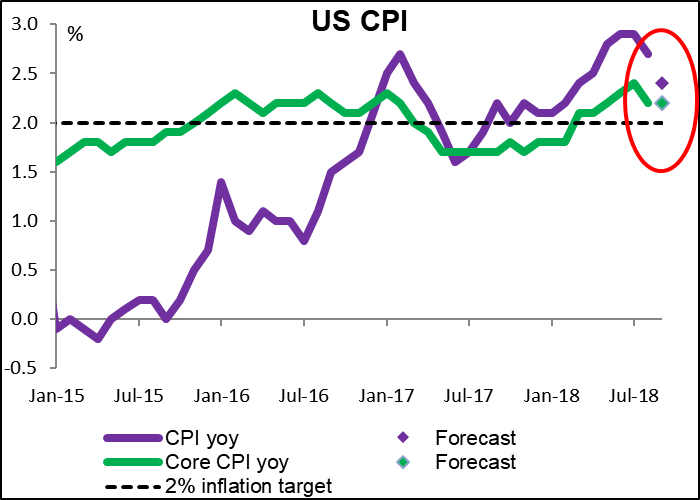 A further slowdown in inflation could dent the dollar’s momentum even if both measures remain solidly above the Fed’s 2% target (which of course refers to the personal consumption expenditure deflator, not the CPI, but the market watches this closely anyway – perhaps even more closely than the PCE deflator itself). Wednesday is short-term indicator day for the UK. That means they release the trade data, industrial & manufacturing production, and the new monthly GDP figures all at the same time. 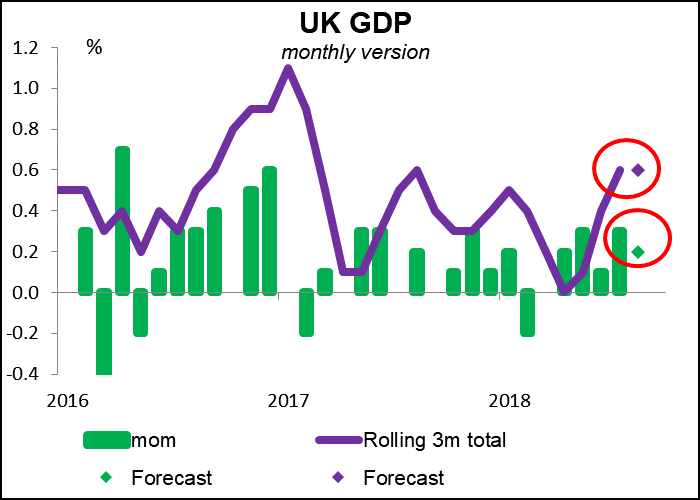 The UK trade figures haven’t been that exciting recently – while there are month-to-month fluctuations, the visible trade deficit at least has been remarkably stable on a six-month moving average basis. 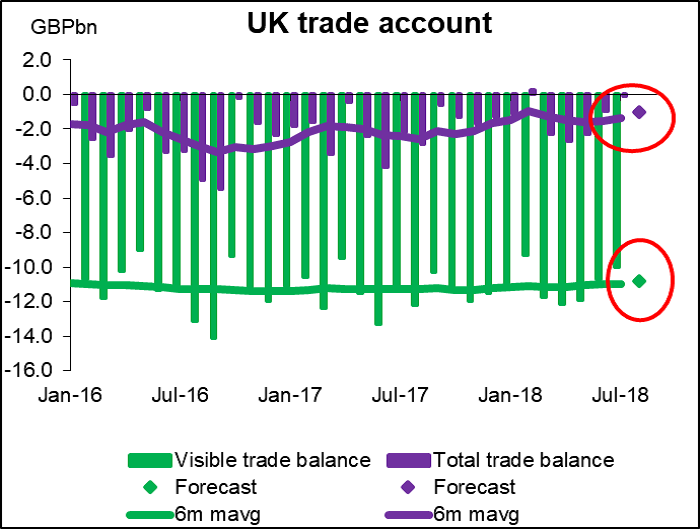 The total trade balance (which includes services) has been more erratic – it actually hit a small surplus in February, but then started widening out again. This month’s forecast is for a further widening, which could be negative for the pound. The picture is clouded however by the fact that the trade figures come out at the same time as industrial production, which is expected to show some acceleration in output, and the monthly GDP figure. It’s hard to tell how much traction the monthly GDP data is getting; Bloomberg rates it zero on its 1-to-4 bar index of market participants’ interest (derived from how many people who ask for an automatic alert about any indicators from that country ask for alerts about that one). That would suggest it’s not even registering on peoples’ radar screens, which I find hard to believe. In this case though, the 3m/3m change is forecast to remain unchanged at +0.6%, which may indeed make it a low-impact number. In any event, Brexit talks will probably take precedence over economics when it comes to the pound. UK PM May has put forward a compromise on the Irish border question that seems to be acceptable to Ireland, but not to the rest of the EU – it’s a sort of “have your Guinness and drink it too” compromise for the UK that leaves them with the benefits of EU membership (free trade) without the downside (free movement of people, submission to the European Court of Justice). Whatever develops on that front will dominate the pound’s movement. 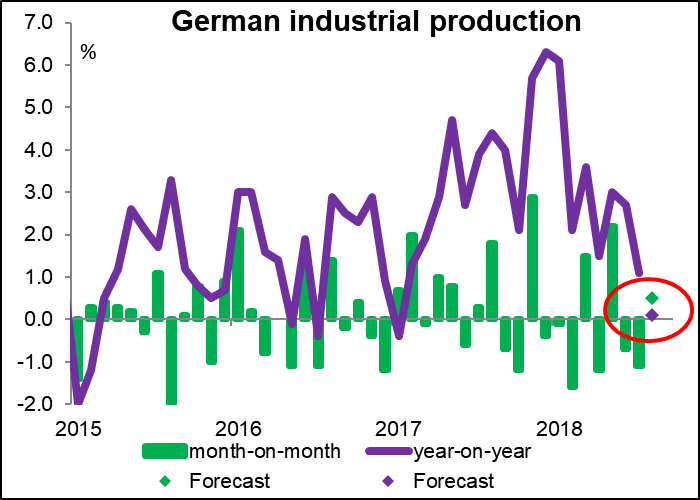 German industrial production is expected to recover slightly on a month-on-month basis after two months of declines, but the year-on-year rate of increase is forecast to almost grind to a halt. 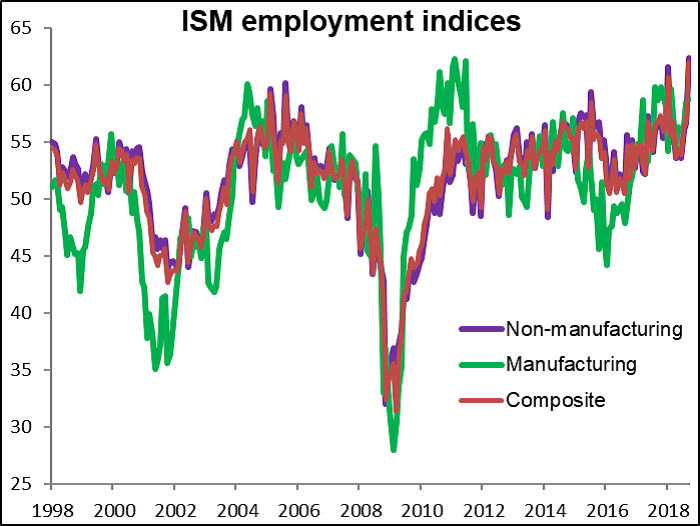 That’s bad news that would corroborate the continued decline in the country’s purchasing managers’ index (PMI). It would be negative for the euro, in my view. On the other hand, the country’s trade surplus is forecast to be more or less in line with the previous month’s below-trend level. That could take some of the political pressure of the euro and help it to weak slightly. 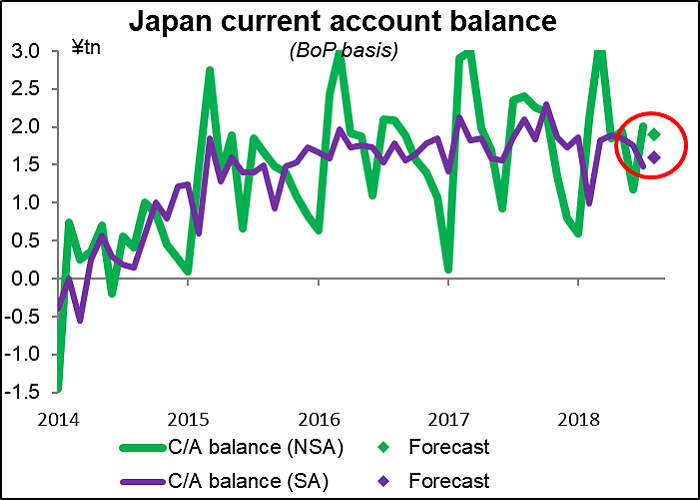 Japan’s current account balance is expected to be slightly lower on an unadjusted basis but slightly higher on an adjusted basis. My guess is that if it comes in as expected, neither figure is a big enough change to make a difference to anyone’s view and therefore should leave USD/JPY little affected. As usual, the yen will be more buffeted by global risk sentiment. Rising US yields have taken their toll on stock markets around the world and paradoxically, that could be positive for the yen even though higher US bond yields should be a negative.